Have you ever FAILED trying to lose weight? Me too. It's hard. And not because the workout or the diet wasn't necessarily good enough, but because you probably lacked SUPPORT and MOTIVATION. Think about how much having accountability and motivation does for you at work, school and accomplishing general tasks and goals. Yet you do not have that it for one of the HARDEST tasks you face….weight loss. If you join the gym, and you don’t show up on Monday, is the gym calling you asking where you were and did you do well over the weekend? No. Actually, in some cases they are banking that you DON’T return. You might have a Trainer, but usually you see them once, maybe twice a week. When you are dealing with stress and wanting to eat, do you have friends you can turn to who will help you stay strong? Many do not. Many people are surrounded by people that actually do the opposite. Not out of malice but because they too struggle with weight loss. My point is, having an advocate, or health coach that specifically has YOUR best interest in mind, provides you the BEST chance at success. Sure, at the end of the day, YOU are the one doing the work, regardless, but, I am there WITH you, which is why I love Challenge Groups and the Beachbody Coach opportunity. I am a product of the process. First, you must TRUST the process. It DOES work, if YOU do. I am a Real Customer and Product of the Beachbody's products, and as a Coach, I want YOU to live the healthiest and happiest life that you can. Fitness and proper nutrition lay the foundation for everything else in your life. I personally have a daily checklist of my nutrition, my workout, and some personal development. I call it my checklist for feeling awesome. The days when I can check off all three, I feel like I am on top of the world, and I want to share that feeling with others. I have different types of support, if you are willing to invest in the right tools. I provide 1 to 1 coaching for my clients who are willing to put in the work. I match effort with effort. The medium I most popularly do this through is called a Challenge Group. Challenge groups are PRIVATE small groups that I run monthly on the Facebook “Group” platform. Sometimes these are called online accountability groups or 21 Day Challenges. You get ME, as well as several other successful coaches on my team within a small group of people, very similar to you and your goals. I will help you choose a program BEST suited for you and your needs as well as discuss what meal plan is realistic for your lifestyle. You will get 1:1 accountability, exclusive motivation, recipes, small daily assignments, fitness tips, and support for 30 days! The benefit to the group is that you get a TON of positive feedback and support while you LEARN. There is always someone “there” to answer or hear your questions. You will both teach and learn from others and will be empowered in the process. There are some accountability guidelines to remain in the group, but as long as you continue to try, commit to the program tools and SHOW UP, you will ALWAYS have unconditional support. JOIN MY TEAM - THE BREAKOUT EMPIRE! FITNESS - You do not have to love exercise BUT you do have to be committed to your own fit journey and that includes getting your sweat on and on a regular basis. NUTRITION - You have to have the desire to want to eat healthier. That does not mean you have to be an expert or a die hard clean eater, BUT it does mean that you are working towards eating healthy and are open to following a meal plan. SHARING YOUR STORY - As Coaches, we share our progress and our own journey to inspire others. We share the good and the bad, the non-scale victories and the struggles that losing weight and getting healthy can entail. LIFE-LONG LEARNING - In order to LEAD, you have to be constantly working on yourself. This means reading personal development, watching training videos, connecting with other leaders and mentors, or basically as Covey would say, "Sharpening the Saw." HELPING OTHERS - You have to be genuinely interested in the success of others and creating a positive culture for people to grow and shine. You can see their potential and help them become the best version of themselves possible. DO THESE SOUND LIKE THINGS YOU WOULD ENJOY? If so, I would love to have an exploratory conversation WITH YOU about joining my team. If you are interested, please fill out a COACHING APPLICATION today by CLICKING HERE. Be a Product of the Product - I walk the walk. I drink Shakeology everyday and have been in LOVE with Beachbody programs for the last 10 years. I have done Turbo Jam, ChaLean Extreme, TurboFire, Les Mills Combat, PiYo, 21 Day Fix, P90X3, and now Insanity Max 30. There are no quick fixes. It's about eating whole natural foods and regular exercise. These programs work for me because I'm a busy mom and workouts I can do at home in 30-45 minutes work best for my schedule. I'm also human, and far from perfect. Being a coach, helps me personally stay accountable to my own health and fitness goals. Invite Others and Share Your Story - I am not a sales person. I'm a Human Resources professional by trade. I make money by sharing my story and inviting others to make their own transformations. I always do a double check to make sure I'm coming from a genuine place with my recommendations and advice. I, like many others, have always known how to lose weight and get healthier. Eating right and exercising are not big secrets, so why don't we all just do it? Now that's the question that intrigues me, and it was not until Beachbody that I felt I had an answer. 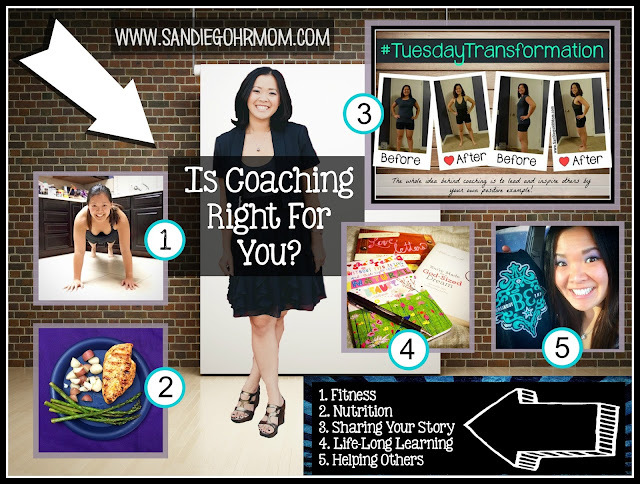 Being a Beachbody Coach has filled in the Why. 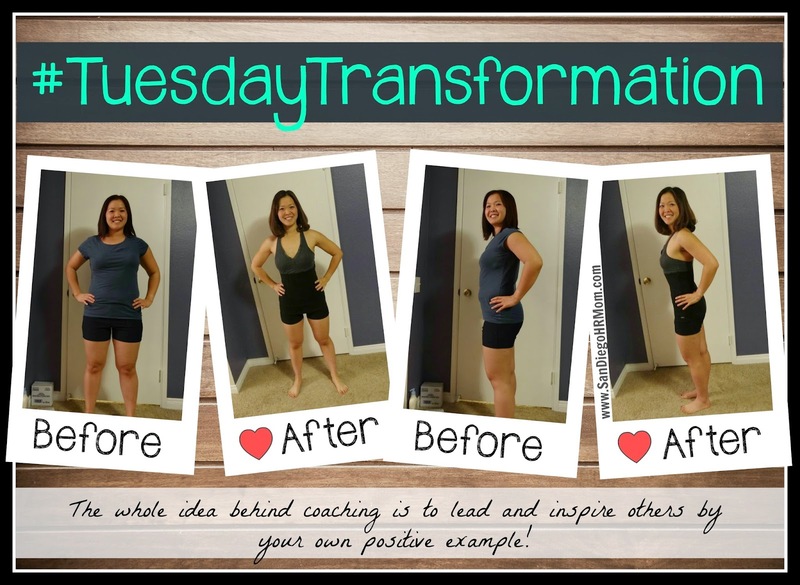 Being involved with Beachbody has made me go from knowing what I need to do, to doing what I need to do to meet my goals. Keep Growing and Investing in Yourself - Constant personal development is needed to sharpen your sword. Some people try something knew and get disappointed after a few attempts without reigning success, and then they blame the activity or venture as being the problem. I admit to being guilty of this myself, until I realized there was a different way. I have been on a journey of reading and improving my personal tool kit for life. I cannot get enough, and I want to share that with those on my team and in my groups. INDEPENDENT BEACHBODY COACH INFORMATION, WHAT DOES IT COST? A one time fee of $39.95 to become a beachbody coach. This is not a yearly or reoccurring fee. You can also get that $39.95 fee waived if you sign up with a challenge pack or you or your spouse is active/retired military then that fee is waived! A monthly website fee of $15. Beachbody gives you three canned websites where you can do some minor personalizing. One site is a Beachbody coach site, one is a specialized Shakeology site and the third is your Ultimate Reset Site. I have decided to create my own website and blog to share my experiences but it is not required. To remain an active coach you need to have a Personal Volume (PV) of 50 points per month. Purchasing a month's supply of Shakeology (at a 25% discount) is 90PV for example and you're done. I agree with Team Beachbody's methodology that you need to use their product in order to be able to explain the benefits of the research they've done. Plus, their supplements actually taste a whole lot better than the other stuff I was using. Recovery drink... think orange creamsicle! HOW DO YOU MAKE MONEY AND WHAT ARE THE BENEFITS? You receive a 25% discount on all Beachbody products including merchandise. If you're using supplements today, just the discount savings alone on let's say Shakeology covers the $15 monthly website fee. Shakeology is a nutrient dense shake that provides a wide spectrum of healthy nutrients in a low-calorie formula. Whether you use it as a meal replacement for weight loss or simply to ensure your body gets all the nutrients it needs for optimal health, Shakeology takes the guesswork out of nutrition. Protein from whey (they also have a vegan option) gives you 8 essential amino acids that help you build muscle, lose weight, support brain function, and keep your skin and bones healthy. Phytonutrients support immune function and have anti-inflammatory properties. It is an effective way to help you lose weight, increase your energy and be the healthiest you can possibly be. Shakeology can help you reduce cravings and promote healthy digestion and regularity. Shakeology recommends that you replace one meal per day with a shake along with regular exercise and a balanced diet, participants who did this experienced remarkable health improvements. It can reduce your total cholesterol, reduce LDL cholesterol, reduce cardiovascular risk, and reduce oxidative damage caused by free radicals. I love Shakeology because I am a busy parent and it is a quick and convenient way to get complete nutrition. It supplies me with the energy I need to help keep up with my daughter and my hectic lifestyle. It is also easier to make and tastier than a salad, and it is an excellent way to eat healthy when eating a full meal is not possible. If you don't like eating fruits and vegetables then this is a great way to get all the benefits of eating a full bowl of fruits and vegetables without having to actually eat them. If you have high cholesterol then this will help you lower total and LDL as well. Mix 1 scoop of Shakeology with 8 oz. of water. If you like, add ice. Or if you want something more filling and maybe even more satisfying, blend your Shakeology with ice and nonfat, almond, rice, or soy milk. Shakeology dissolves easily, but blending it will give it a thicker, creamier texture. If you are interested in trying Shakeology message me for additonal information.